Many people sleep the recommended 7 to 8 hours each night and wake up feeling refreshed. Others get the same amount of sleep and wake up feeling as tired as when they went to bed. If you’re in the latter group, you may suffer from sleep apnea – a serious sleep disorder in which a person stops breathing during the sleep cycle. If so, you’ll need a CPAP machine and mask – such as the ResMed Swift FX Mask – to regulate your sleep and prevent significant health problems. Men with beards may face some issues with CPAP masks that other men don’t – such as the fit and the seal that prevents air from escaping – so our following reviews include masks that men with facial hair can wear comfortably while getting their full, intended effects. The best CPAP masks for beards. Sleep apnea is nothing to ignore, friends. If left untreated, it can lead to high blood pressure, strokes, heart failure, diabetes, depression, and all sorts of other nasty – and potentially fatal – health issues. Make sure you choose your treatment and CPAP mask wisely. CPAP masks and machines have come a long way over the past several years, and your buying options are better and more varied than ever. That’s good news, obviously, because finding one that works best for you (and fits) is important, because it involves your overall health. While men with facial hair may need to be a bit choosier when picking a CPAP, the bottom line is that beards or mustaches shouldn’t keep you from using any mask. However, there are a few things to keep in mind when buying a CPAP, regardless of whether you have facial hair. The selection process is sometimes a bit overwhelming when choosing a CPAP, because there are several things to take into consideration, including whether you’re a mouth breather, you’re claustrophobic, whether you have allergies, etc. Among the advantages of nasal pillows is that they’re lightweight, compact, and have minimal contact with your face. They rest at the entrance of your nostrils to create a seal that channels air into your nose. Many of the earliest versions of CPAP masks were full-faced, meaning they covered a larger area of the face, i.e. from the bridge of your nose to just beyond the bottom of your mouth. They’re a good option for people who breathe through their mouth or have a hard time adapting to nose breathing exclusively. Unlike a nasal pillow, nasal CPAP masks cover a larger area (from the bridge of the nose to the upper lip area). It delivers a more indirect but natural airflow than the nasal pillow mask and is often recommended for people who need a higher pressure airflow. Note: We’ll dig deeper into different types of CPAP masks later on in the article. It’s tempting to buy a CPAP with a looser fit if you have you a full beard, but a mask that’s too loose will result in air leaks. Air leaks mean you won’t reap all of the benefits of your sleep therapy. You want a good seal between the mask and your skin and if that means starting with a smaller size and working your way up, so be it. If your CPAP mask isn’t comfortable, the chances are good that you’ll end up not wearing it. Not wearing it means you won’t get any relief from sleep apnea and increases your risk of experiencing health problems associated with apnea. Be very aware of how your mask feels overall once you’ve tried it on; is it something you can see yourself wearing for eight hours each night without feeling that it’s pinching your face, or is it in the way when you switch positions? Heated tubing enables the air within the CPAP tube to remain at a constant temperature, so that condensation doesn’t build. 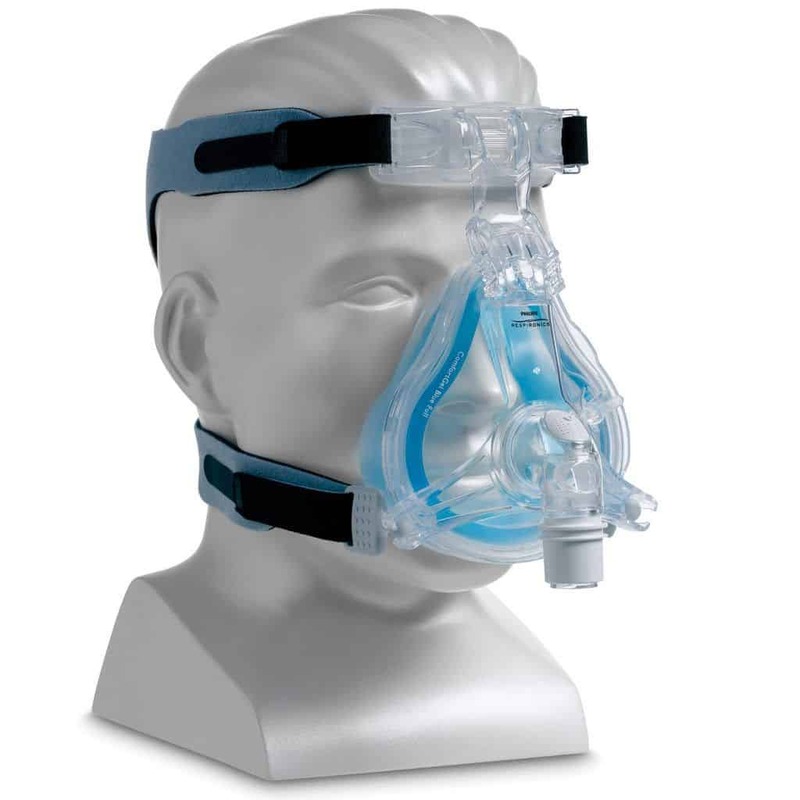 The straps that come with CPAP masks are an important part of the mask’s overall fit. Most of them are easily adjustable, and some need no adjustment other than positioning them on your head in a way to help give the mask a good seal. Most reviews of the best CPAP mask for beards include the ResMed Swift FX, which is a nasal pillow mask that gets high marks in many categories. It comes with comfortable nasal pillows that are soft and cause little irritation. The pillows are available in a range of sizes to allow you to get the best fit possible. The Swift FX’s cushions are second-to-none and provide an excellent seal. You’re less likely to lose your seal on the Swift FX than you are on many other types of CPAP masks. It comes with stable headgear that’s easily adjustable to provide the best fit possible. Like the nasal pillows, the headgear comes in different sizes to fit most heads and face shapes. It’s easy to assemble and disassemble, because it comes with only four parts. The Swift FX’s durability is also top-of-the-line. The straps are made to last for a long time and, as mentioned, need little adjustment once the mask is on your face. While some say the Swift FX gets a bit noisy at times, it’s quiet enough that it shouldn’t disturb you or your bed partner. It’s also easy to use, and you don’t need a lot of direction or instruction when you pull it out of the box. 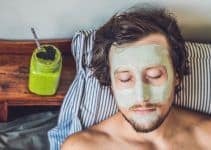 Full-face CPAP masks are often a good option for men with beards, and we think the Respironics ComfortGel Blue Face Mask is the best of the lot. In short, the folks at Respironics took an already good product and made it even better. The cushion is also much lighter, while the headgear makes adjustments – and attaining a premium fit – easier. 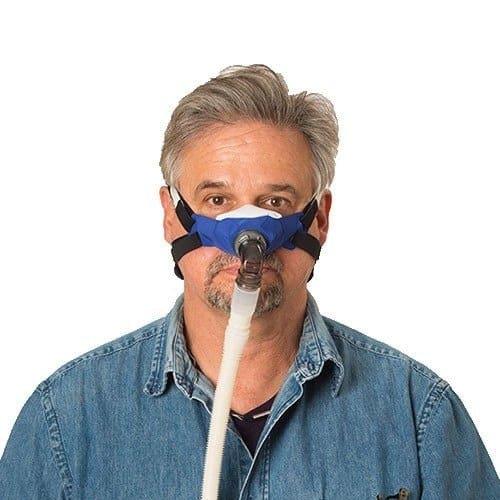 If you’re not a nose breather or can’t get the hang of nose breathing, a full CPAP mask is your best option. Furthermore, you can sleep comfortably in whatever position you prefer – on your back, on your sides, etc. The ComfortGel Blue Face Mask comes in four sizes: petite, small, medium, and large. The Respironics ComforGel Mask earns high marks in a lot of categories, thanks to a variety of features that make it comfortable and easy to use. You’ll like how you feel after a good night’s sleep, thanks to this CPAP. 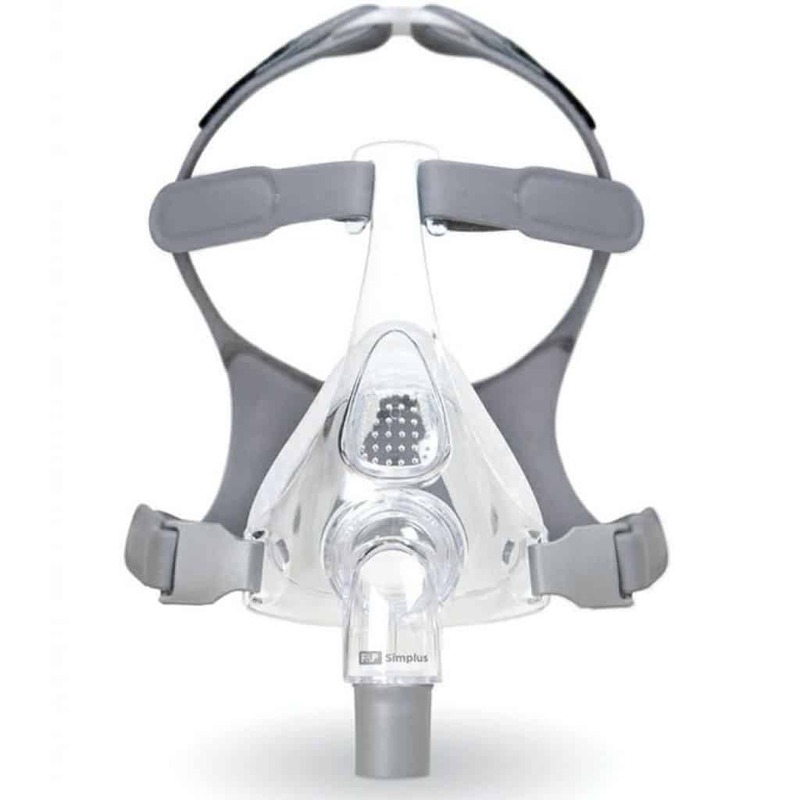 Another product to check out if full masks work best for you is the Fisher & Paykel Simplus mask. Everything about the mask shows – and feels – that it’s designed for comfort while also delivering the effective sleep treatment that your health demands. The Simplus Full Face Mask has three trademarked components that provide comfort and an exceptional seal with every use: RollFit, ErgoForm, and Easy Frame. The RollFit function enables you to achieve an optimal, one-piece seal as it rolls back and forth on the bridge of your nose. It minimizes pressure on the nose while ensuring a tight seal that prevents air from escaping. The RollFit seal also incorporates an advanced air diffuser that’s designed to keep noise and air draft to a minimum. Also, you’ll like the fact that the RollFit seal leaves fewer impressions on the nose and face than with other masks. The ErgoForm headgear includes panels that provide structure and support to create maximum stability. The headgear “self-locates” on the back of the head, which allows for maximum head movement without the mask becoming dislodged. We also like that the ErgoForm headgear consists of breathable material that minimizes sweat and moisture buildup while in use. The Easy Frame is, as its name suggests, is easy to use and is small, stable, durable, and doesn’t obstruct your vision – which is helpful if you like to read or watch TV while in bed. The frame comes in one-size-fits-all and includes an easy-clip frame attachment for effortless assembly after cleaning. The Easy Frame accommodates small, medium, and large pillows, which are easily interchangeable. The Fisher and Paykel Simplus is one of the best full face CPAP masks for beards. It fits snugly on your face, but not too snugly, and is easy to adjust while creating an optimal seal to keep air from leaking out. There are plenty of good nasal CPAP masks available, but few can match the quality of the SleepWeaver 3D mask. “Flexibility” is a word you’ll often see in reviews of the SleepWeaver 3D CPAP Mask, because of flexible materials that make it suitable for patients of all variety of face shapes and sizes. Made of soft, lightweight cotton material that eliminates skin irritation, the headgear’s straps rest above and below the ears to provide comfort and stability (without leaving indentations in your skin). The headgear’s design also allows you to wear glasses or watch TV while you wear the mask. What else do we like about the SleepWeaver 3D CPAP Mask? 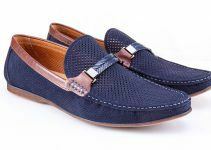 The feeling of cotton against the skin is much more comfortable than the feel of rubber, silicone, or other materials. The SleepWeaver 3D CPAP Mask has a lot going for it – not the least of which is its comfortable, lightweight design. You’ll love its non-irritating cotton materials. How well your CPAP mask fits is perhaps the most important factor you should take into consideration. 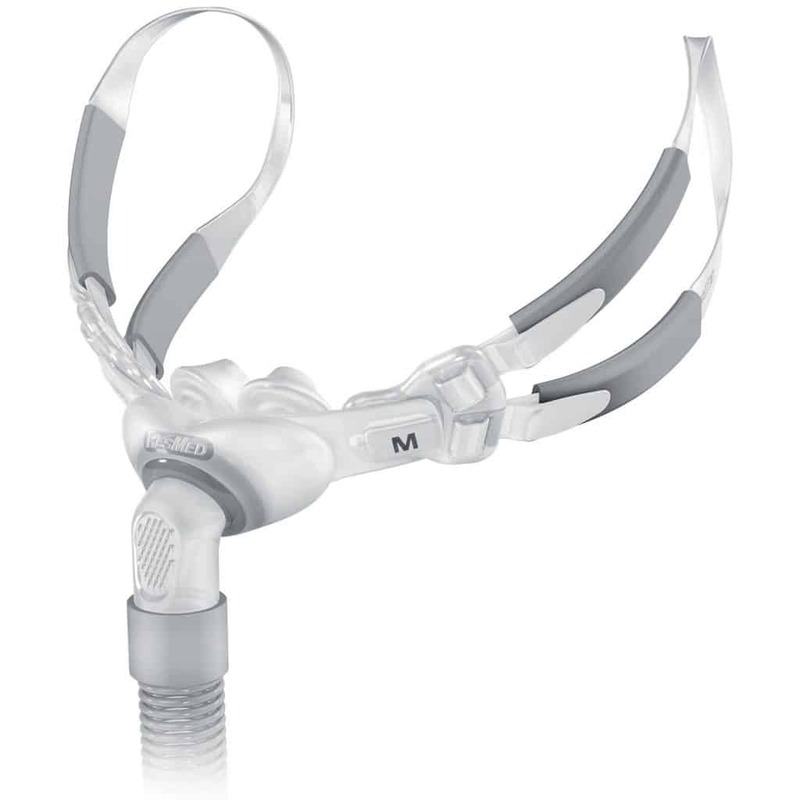 After all, one of the biggest complaints among CPAP patients is that the mask doesn’t fit correctly, which leads many apnea sufferers to not use it at all. Check your CPAP to make sure it fits comfortably, both when you’re sleeping and sitting upright. You should check for air leaks in both positions. Also, check the fit at various air pressures and while in different positions lying on the bed: on both sides, on your back, on your stomach, etc. If adjusting the headgear doesn’t resolve air leaks, then the mask isn’t a good fit. An important point to remember is that your facial muscles change when you lie down, and they relax even further once you’re asleep. Make sure that you’re comfortable with putting on your CPAP and taking it off and that you’re adept at adjusting the straps if needed. Getting a proper fit is your primary concern, but you shouldn’t have to sacrifice convenience. It’s easier to get the proper fit during daylight hours, before you become tired. In most cases, finding the perfect fit is simply a matter of a few adjustments. Finding the right fit typically becomes second nature the more you become accustomed to your mask. 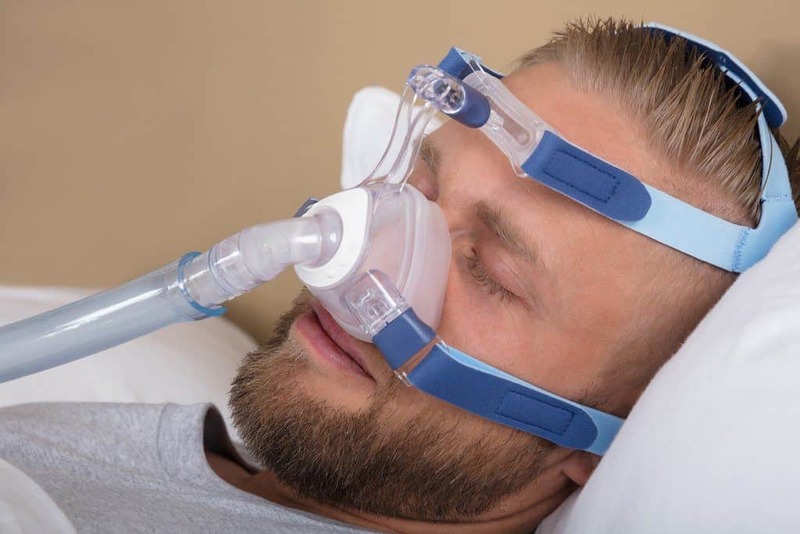 Sleep technologists will fit your CPAP according to a variety of factors, including whether you’re a mouth breather or nose breather or if you have a history of nasal obstruction, an elongated soft palate, or jaw that’s recessed further than it should be. All are factors that go into determining if you need a full face mask or a nasal CPAP device. 5. What’s your face shape? The shape of your face is another important consideration for getting a proper fit and may be a source of leaks. You want your straps to fit snugly but not so tightly that they cause leaks. You need to tighten the strap just enough to ensure a good seal. When a mask is too tight, the cushion that creates the seal will fold over on itself, allowing air to escape. Again, start with a smaller mask when finding the right fit for you. Only work up to a larger size if you can’t get a good seal with something smaller. Earlier, we briefly discussed the three types of masks: nasal pillow, full face mask, and nasal mask. 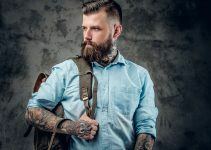 Let’s take a closer look at each type, how they work, their advantages and disadvantages, and which one is best for you (as a committed beardsman). Nasal pillow CPAP masks have grown in popularity, thanks to their compact design and lighter weight than other types of masks. The two nasal pillows rest at the entrance of the nostrils, while pressurized air is channeled directly into your nose through soft nasal tubes. Because nasal pillows rest on your upper lip, you don’t have to worry so much about facial hair altering the fit. They work best at low to mid pressure prescriptions, because the direct airflow may become uncomfortable at higher settings. Nasal pillows are the smallest of the CPAP masks. Because they’re lightweight and of a smaller design, nasal pillows are ideal for folks who are claustrophobic (such as with a full face mask CPAP) or who are uncomfortable with material touching their face. Men with beards should have few problems – if any – when using them, because nasal pillows rest on the upper lip and don’t extend to the beard. The nasal pillow seal remains tight, whether you have facial hair or not. They’re great for people who like to wear their CPAP while reading or watching TV before they fall asleep, because they offer a greater field of vision. You can even wear glasses while wearing your nasal pillow CPAP. There’s less leakage, because the airflow goes directly into your nasal passages. They’re good for people who are active sleepers and toss and turn a lot. Perhaps not the best option for people who need a high-pressure airflow setting, because the higher pressure may cause discomfort as the air blows into your nostrils. Mouth breathers must adapt to nasal pillows, because they’re not accustomed to breathing through their noses only. Full face CPAPs represent the traditional type of sleep therapy and are still used today. Unlike nasal pillows and nasal masks, a full face CPAP covers both the nose and mouth and a larger surface area of the face overall. Because of their bulky size, full-faced CPAP masks are uncomfortable for some people, but they’re a great solution for people who need a high-pressure CPAP prescription or who are most comfortable breathing through their mouths. You can use a CPAP mask if you have a full beard, but the fit is everything, because the uneven surface caused by your beard may cause air leaks. Why use a full face CPAP? A CPAP face mask makes it harder to read or watch TV while sitting or lying in bed. A nasal CPAP mask covers a larger surface of your face than a nasal pillow, as it extends from the bridge of your nose to your upper lip area. It provides a good compromise between a full-face mask and nasal pillow, especially for patients who need higher pressure settings. Why use a nasal CPAP mask? They’re not as effective for people who frequently experience colds or allergies that cause nasal congestion. There’s nothing gimmicky or “trendy” about CPAP masks or machines. They’re serious business for users who suffer from chronic sleep apnea that may lead to a host of serious health problems. While others may marvel at your snoring (or run for cover), they’d be wise to urge you to get tested for apnea ASAP. All that said, choosing the best CPAP masks is a challenge, because there are many different styles, and how a mask feels varies between users. Our goal was to include at least one mask of each type – nasal pillow, full face mask, and nasal mask – while considering a variety of other factors, such as comfort, durability, the firmness of its seal, etc. The bottom line is that there are a lot of good CPAP masks available. Meanwhile, the technology keeps improving. Finding the right mask for you is something to take seriously; after all, your health is at stake. That wraps up our review of the best CPAP masks. Do you wear a CPAP mask? Do you use any of the masks listed here? Let us know, because we always welcome your feedback and suggestions. I have a beard and use a nasal pillow. The pressure that I use forces air out of my mouth, even with a chin strap. I tightened the chin strap which helped some, but air still comes out. Any suggestions? I have the same problem (minus the beard) with the nasal only masks. (I thought if I checked out masks recommended for beard wearers, they might help with fitting properly on my chin). My mouth is forced open even with any chin strap. I have been using full-face masks, which also force my mouth open, or leak when my mouth starts to relax a bit. I have tried 17 masks so far and cannot get any of them to fit properly. I haven’t had a good night’s sleep in years. I am at my wits end. Thank God for CPAP.com, as they have really helped me to sort through many masks and return them when they don’t fit. Any help from anyone would be greatly appreciated. My husband and i are both mouth breathers and are both on CPAPs and our ENT suggested taping our mouths. My husband and i both now do this as well as our dentist and his receptionist. My husband who has a beard uses the Nexcare gentle paper tape (clear) across his lips and i use the Nexcare sensitive skin tape which is blue. Works like a charm. The Docs don’t know why this works but it also may keep you from getting up to go to the bathroom at night. Look it up. Hope this helps. I am a new user of a Simplus full face CPAP mask (approximately 30 nights) and I also wear a full beard. My initial experience is that this mask leaks badly so I can not agree with your comments, above, in regard to this mask for folks with beards. I would be interested in suggestions for resolution of these problems . . . I’m a mouth breather so I was started out with a full face mask. Are the full face masks with a gel seal a better option? If so, which one to try? If you are working with a home care company that will let you try masks out in the office, that is your best bet. Although that is becoming more difficult to find. Option one would be to try a nasal mask with a chin strap to keep your mouth closed. Most people need the strap long enough to retrain them to keep their mouth closed, but others can’t stand it. My favorite Chinstrap is CareFusion TMS-09ADJ as it stays in place well. Put on the chin strap then the nasal mask. The best nasal mask I have found is the Dreamwear. You can order the “fit pack” to see which size mask fits you best. The majority of people use a medium frame. It is nice because it cups just under your nose avoiding facial hair entirely, and it is the most popular in my sleep lab. The Dreamwear frame is interchangeable with the Dreamwear full face mask (you need the mask and the new headgear to make it work). I really want to try this one because it theoretically solves many CPAP mask problems, but it is new and I don’t have it in the lab yet. The most popular full face mask I have is the ResMed AifFit F20 with the silicone seal. It does not have a t-piece that goes to the forehead so it tends to be more comfortable then the older style full face masks. They came out with another mask that is the same style but with a memory foam cushion that I haven’t had a chance to try out yet but in theory it would work very well for people with beards if that is your problem as well. They have the same shape mask in a AifTouch F20 which is just the same thing with a soft foam seal if you don’t like the sensation of plastic against your face. The foam seal doesn’t stand up to washing as well over time (but isn’t bad either) but does great for people in hot weather or who tend to sweat on their face at night because it doesn’t feel sticky then. Good luck. The gel seals are a personal opinion, they seem to be a love them or hate them deal. They seal well but are heavier on the face. If you are trying a bunch of masks looking for a good one, sometimes the best deal is to find a site online to buy them at first because several have a 30 day money back warranty so you can try multiple styles without breaking the bank. Good luck!